Cactus Language offers a range of language courses in the UK, the US and worldwide! Holy Week, or Semana Santa, is one of the most important events on the Spanish calendar, and no celebrations are more famed than those that take place in the Andalucian city of Seville. Falling in the week leading up to Easter, Semana Santa draws in around a million spectators each year, who come to see the exceptional processions, floats and traditional dress that mark the largest religious event within Spain. Semana Santa takes place between 13th and 20th April 2014, starting as always on Palm Sunday and ending on Easter Sunday. 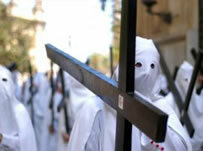 Given its religious significance, Semana Santa is traditionally a rather solemn affair. Those who want a more light-hearted Easter experience may come two weeks later for the famed Feria de Seville (5th-10th May), a 6-day fiesta that consists of flamenco and sevillanas dancing, parades, fairground rides, sherry drinking, dressing up in finery and generally partying in typical Spanish style. That said, Semana Santa is by no means ‘dull’: bars are full around the clock with friends and entire families getting together to enjoy the close sense of community and occasion. As declared in the rule of the ordinances back in the 17th century, Semana Santa sees the religious (namely Catholic) brotherhoods of Seville, known as cofradias or hermandades, make their way through the streets of the city with floats, or pasos, representing scenes of the Passion, Death and Resurrection of Christ, or of the Virgin Mary, la Dolorosa, mourning her son. The cofradias walk in penitence in front of their pasos, dressed in robes and often quite sinister hoods, from their home church to the Cathedral of Seville (the third largest cathedral in the world) and back. Although they take the shortest possible route, this procession may take up to 15 hours. In total the streets of Seville will see an 57 brotherhoods, made up of 60,000 brothers, carry an impressive 116 floats down its wide tree-lined avenues and through its narrow, cobbled streets. The most popular processions will be saved however until the night of Maundy Thursday, when they will set out in order to arrive at the Cathedral at dawn on Good Friday, known as the madrugá. Grandstands are built in the main plazas and seats sell out weeks in advance for the culmination of this unique and unforgettable week. Semana Santa is a reminder of how Spain is inextricably linked to its past and its traditions; although many of the country’s other fiestas have a religious slant to them, involving much festivity and merriment, this is one celebration which gives us a deep insight into the Spanish psyche and which will no doubt be respected for years to come, by young and by old. Cactus Language offer a range of Spanish language courses in the UK, New York, Spain, South America & Central America. Church bells are silent from the day before Good Friday to Easter Sunday when they ring out again. The bells are said to go to Rome to see the Pope, and then return with Easter eggs, which are hidden in houses and gardens for children to find. Other traditional Easter foods include lamb, goat and special Easter breads such as Panettone, Colomba Pasquale, Fugazza Vicentina, Pizza di Pasqua and Fiadoni. Religious processions are held in many Italian towns and cities on Good Friday, Easter Saturday and sometimes on Easter Sunday. They often involve statues of Mary or Jesus being paraded through the streets by people dressed in medieval costumes while olive branches or palm fronds are waved by the spectators, and are used to decorate the churches. In Florence’s historic centre (centro storico) the Easter celebrations, known as Scoppio del Carro (explosion of the cart), involves a large 17th century cart being pulled through the streets by a team of white oxen, which are decorated with garlands. The precession goes to the square outside the Basilica di S. Maria del Fiore, where they hold mass. After the service the Archbishop lights a dove-shaped rocket which goes down a wire and hits the cart in the square, setting off fireworks. The idea is that the loud explosions will ensure a good harvest. Following on from that is a parade of people dressed in medieval costumes. Processions are held all over Sicily to celebrate Easter. For example, in the Sicilian town of Enna a procession of two thousand friars dressed in medieval costumes is held on Good Friday, while in Trapani, statues made by local guilds are carried through the streets in a procession that lasts 24 hours. In Prizzi, south of Palermo, some of the people dress up as devils with red and black masks, horns and grotesque noses and they go through the streets trying to persuade spectators to buy them drinks. At the same time other people dress as angels and stage a symbolic struggle with the devils, who are defeated and have to buy drinks for everyone. In Sulmona in the Abruzzo region people dress in green and white on Easter Sunday and gather in the main piazza. The woman playing the Virgin Mary is dressed in black at first, but after she goes to the fountain and doves are released, her outfit changes to colour to green. After this there is music and much eating and drinking. In Rome on Good Friday the Pope celebrates the Via Crucis in Rome near the Colosseum. A huge cross with burning torches lights the sky as the stations of the cross are described in several languages, and the Pope gives a blessing after this. On Easter Sunday the Pope celebrates mass at St Peter’s Basilica. 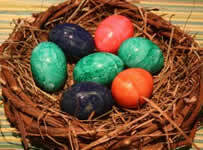 On Easter Monday (La Pasquetta), there are dances, free concerts and games, often involving eggs. One game, Ruzzolone, is played in Panicale, a small town in Umbria, and involves rolling large cheeses are the walls of the village. The winner is the person who gets their cheese around the walls using the fewest strokes from a stick. 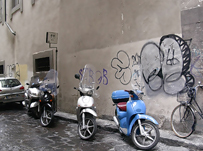 Cactus Language offer a variety of Italian language courses in the UK, New York and Italy. The Old Vienna Easter Market at the Freyung, is another market with a beautiful setting, this time in the beautiful main square in the Old Town. 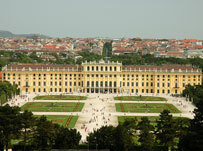 Each year, the largest mountain of Easter eggs in Europe is constructed here, normally consisting of 40,000 painted Easter eggs. Another market is the Arts and Crafts Market Am Hof, which also offers stalls celebrating Easter traditions and offering decorative crafts. Click here to learn more about Cactus Language’s German language courses in Germany, Austria, Switzerland, the UK and the US! March 2010: It’s all about treats this month! There’s something about March that lifts the spirit after the long and cold winter months. With the days getting longer and the sun beginning to burn a little warmth through the clouds, we’re emerging from our hibernation eager to make plans and get out there and do something. http://www.cactusworldwide.com/blog/wp-content/uploads/2013/10/March2010.jpg 119 590 Philipp Eng http://www.cactusworldwide.com/blog/wp-content/uploads/2013/07/cactus-blog1.jpg Philipp Eng2010-03-01 15:21:402013-10-28 15:55:41March 2010: It's all about treats this month! Easter represents a time of year that is filled with positivity and expectation for the approaching summer months, and is when many people finalise their summer plans and projects. http://www.cactusworldwide.com/blog/wp-content/uploads/2013/10/April2009.jpg 203 650 Philipp Eng http://www.cactusworldwide.com/blog/wp-content/uploads/2013/07/cactus-blog1.jpg Philipp Eng2009-04-01 15:38:282013-10-28 15:53:32April 2009: Happy Easter!